Air Connect are sales agents for water blasters and steam cleaners from big to small, for home use to large industrial machines which include trailer mounted units built to your specific requirements. Our range includes electric (single phase and three phase), petrol and diesel engine driven. Both hot and cold water. Our Brands include: GTR water blasters, Honda Engines, Cat Pumps, Annovi, Reverberi, Interpump, General Pump and Hawk. At AirConnect we understand that the reliability of your equipment is important to you. We can provide a regular maintenance programme to ensure that your waterblasters and steam cleaners keep running smoothly and free from problems. We repair and service all makes and models from big to small (even if you didn’t purchase it from us), including; Karcher water blasters, Nilfisk water blasters, Ryobi water blasters and all other makes of water blasters. 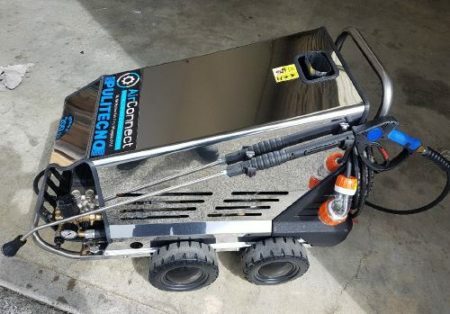 AirConnect can repair all makes and models of water blasters or steam cleaners and all associated equipment including; telescopic lances, hand guns and lances, whirl away heads, hose reels and all associated parts. AirConnect have spare parts and accessories readily available, including; replacement tips, guns, turbo wands and high pressure connectors. We also can supply some of the best quality hose on the market. We also stock most parts for genuine Honda stationary engines. © AirConnect 2019. All rights reserved.